Universal Studios Theme Park is one of the showcase attractions in central Florida. Radio remotes have been broadcast from many amusement parks, and Universal Studios is no exception. The radio facility has two complete studios that can operate independently or jointly. The radio studios occupy a small space next to the Brown Derby Hat Shop on Rodeo Drive, not far from the entrance to the Universal Studios theme park. At first glance, the building facade blends with the surrounding decor and could be easily overlooked as you walk down the street. Once inside, however, the decor speaks for itself. The studios were built in 1993 and currently host three or four stations every week. There are four rooms within the studio area. In addition to the two broadcast studios, there is also a reception area and an office. The office can be used as a limited-capability third studio in situations where studio demand is high. The two radio studios have large windows that look outside and offer constant communication to and interaction with spectators and park visitors. The studios themselves have themes. The first studio is the smaller of the two rooms and carries a theme from the movie Jaws, which is featured in one of the rides in the park. The second studio is somewhat larger and is built around the Terminator 2 3D attraction based on the Terminator 2 movie. The T2 studio features a stark, gray-metal interior, highlighted with visuals, blueprints and Terminator 2 parts reminiscent of the attraction's Cyberdyne Systems headquarters. The T2 studio also has a model of the T-1000 character sweeping in from the ceiling. The model can be positioned to face any point in the room. Live interaction is possible between the studio and talent, visitors or park characters outside. 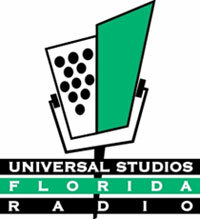 The new radio studios at Universal Studios Orlando were installed in a relatively short time. As is expected with any remodeling project, time and effort were put into planning the change to minimize the down time. While this is not an active radio station per se, the facility hosts several stations per week in addition to serving as the main audio production facility for the entire theme park. The next photos below show the remodeling in progress as equipment is delivered, unpacked, assembled and installed. When designing or renovating a facility, attention is primarily paid to the facility's function. Generally, the desire to create a visually appealing space is a secondary priority. When a company's prime business is the visual attraction, form and function share equal importance. Such is the case with Universal Studios Orlando, which rebuilt the radio studios in its central Florida theme park. There are five rooms for the studios. Visitors are first welcomed into a green room with couches and a kitchenette. This area helps visiting stations feel at home during their visit. It also allows the station to handle large groups of people that visit the studio. From the green room, a short hallway leads visitors to the remaining four rooms: two on-air studios, a rack room and an office. In the T2 studio, a long metallic shaft curves downward with the head of the T-1000 Terminator at the end. This can be positioned to face anywhere in the room so that operators can have a captive audience or a sentinel. On the walls are back-lit schematics of the 800 series Terminator. The studios were built in 1993 by Pacific Recorders and Engineering. While only small changes have been made throughout the nine years of faithful service, Universal felt that the time was right to perform a complete upgrade. Now that the renovation is complete, the overall form of the studios has not changed much from the original design, but the technology behind the equipment certainly has.